Between failed projects, we had lunch at Winter Garden, in Long Beach, MS. It is two doors down from my Grandmother's house. Its backyard is diagonal to my parent's yard. And we pretty much watched the place get built over the last year. The interior is still a work in progress. The floor is stained and etched cement. The chairs look like remnants from a Chinese food place. And there are unfinished sketches on the walls. It has potential and might have a good bar (we didn't check it out) but the hand-crafted snowflakes dangling from the ceiling threw me for a loop. What do people in South MS know about snowflakes? It would be like flying rebel flags in a New England Clam Chowder shop. So I took a leap of faith and tried the Taco Salad. The pulled pork in the midle was very tender and nicely seasoned. It had a lot of cheese. The shell was very good. But the lettuce was mostly the foul white bones that I can't stand to eat. It was drowning in tomatoes. And I was expecting some spicy beef to be on it. Also missing was the sour cream (though the server brought me some on the side) and the salsa or any manner of dressing. Roger and Rob both enjoyed their Cuban's. I may go back and try a burger and a drink at the bar. 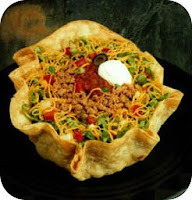 The Taco Salad had potential, but I won't be trying it again.